Additional Information/Highlights: Only Designs for Health fish oil products carry the TruTG™ seal, which means they are delivered in the form found in nature and are of superior TG potency. The TruTG™ seal guarantees a minimum 90% triglyceride-bound (TG) omega-3 fish oils, a level that is 40% – 50% higher than the industry standard for most TG fish oil concentrate products. 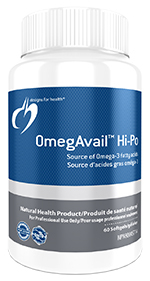 OmegAvail™ Hi-Po is molecularly distilled and filtered to ensure purity and to maximize the removal of metals, pesticides, PCBs, and other contaminants. Lipase is added to enhance the digestibility and mixed tocopherols (antioxidants) are added to enhance stability of the product. Non-Medicinal Ingredients: Natural lemon flavour, mixed tocopherols concentrate, gelatin, glycerine, annatto extract, lipase. 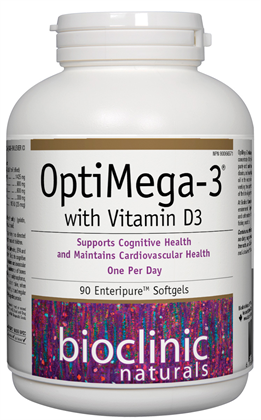 Recommended Dose: Adults: Take two softgels per day with meals, or as directed by your health care practitioner.